The attacks on the new immigration law passed by the state of Arizona from our “dishonest, lying president” and his politburo mainline media on down is downright sickening (of coarse as Carl Marx, the father of Communism said, "Control the Media and you will Control the People" so this is not a surprise). While this law may not be perfect (most who have made derogatory comments clearly have not read this law based on their comments), all Arizona is attempting to do is bring law an order back to their state that has been plagued by crime as a result of the criminal element that has crossed into their state, as well even those who are otherwise good people are still sucking services from the legal residents of Arizona and elsewhere. 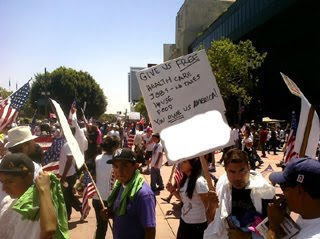 The picture to above/left shows a protest in Los Angeles, that despite some disingenuous photo shopping often shown via emails still tells a lot about political correctness versus upholding laws to protect our citizens & nation (please note that I photo shopped out the lower part of this sign which contained “We Will Shoot More Police in Arizona Until We Get Free”, as this appeared to be added by someone via Photoshop and IMHO is not only dishonest, but unnecessary as the protest against a state law to uphold our nations laws says it all, kind of like protesting a crackdown on DUI offenders with a new law after political correctness decides against enforcing DUI laws). What is sickening to me is that during some very dark days financially after moving to Oregon to get a fresh start from even darker days in our family's past (& still with debts over $30,000 that were brought on by others), I attempted to receive Oregon Trail (Food Stamps) and was turned down even though our income was well under the poverty level for a family of our size, yet persons can come here by violating our immigration laws and get more help than I could ever dream of. Please do not get me wrong, as someone who worked for almost two decades along with many immigrants from south of the border at a restaurant I maintained aquariums for (the Bahooka Restaurant) and elsewhere, I certainly understand the need to try and get here to better one's family and most of these persons were honest and hard working. HOWEVER I too have attempted to make my families life better and have broken NO laws, yet I am not worthy of anything (not that I want hand outs either). As well our open borders policy makes it quite easy for Terrorists to enter our country bringing whatever tools of terror they choose along too. One concern that many rightfully have is profiling, however I am sorry while our dishonest and lazy to downright evil media lie and cover up for the worst president in our nations history, they fail report the truth and will imply that 70 year old Tea Bag party members are potential terrorists ignoring what the profiles say would be a more likely terrorist. Sorry but profiling is necessary to protect our citizens. Where the concern has some merit is the fact that there are always going to be rogue police officers, but these are the minority and the law makes provisions for this. To not enforce laws based on this concern is analogous to stating we should no longer have speed limits because there are dishonest and lazy officers (such as I have observed with the CHP in my monthly trips to Los Angeles along interstate 5 that will wait along the road for the most minor of speed infraction all the while I have witnessed reckless driver that are even reported not be stopped). So what do we do, just say no speed limits to stop this occasional abuse of authority? 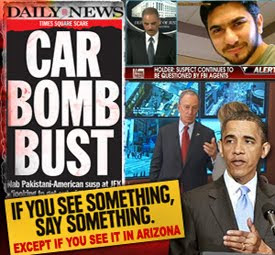 Obama's comments as usual were pure vomit as he implied that the laws were a misguided attack on the original citizens of Arizona. WHAT? Is this not the man who in his ignorant evil lack morality or knowledge of history chided the Israelis for building in East Jerusalem??? Israel has been living in this land for about 3000 years, much longer than the Muslim religion even existed. Make up your mind Mr. Obama, you disgusting excuse for the leader of what was the greatest nation on earth until you took office and began apologizing for our spreading of freedom around the world, often at the loss of thousands of American soldier’s lives! I'm an Arizona state senator. I want to explain SB1070, Arizona's immigration bill, which I voted for and which was just signed by Gov. Jan Brewer. -- The people who live within 60 to 80 miles of the U.S.-Mexico border have been terrorized by the Mexican drug cartels and human smugglers. One rancher testified that 300 to 1,200 people cross his ranch every day, vandalizing his property, stealing his vehicles, cutting down his fences and leaving trash. He testified that in the last two years, he has found 17 bodies and, alarmingly, several copies of the Quran. -- Another rancher testified that drugs are brought across his ranch in a military-style operation, with guards armed to the teeth. A point man with a machine gun goes in front, a half-mile behind are the fully armed guards, a half-mile behind them are the drugs, and behind the drugs are more guards. This was not the only rancher we heard who talked about the drug trains. -- One man told of two border crossers who came on his property, one of them shot in the back and the other in the arm by drug runners who forced them to carry drugs and then shot them. They frequently hear gunfire at night and are afraid to leave their ranch for fear of what the smugglers will do to it. The Border Patrol is not on the border. It has set up 60 miles away with check points that do nothing to stop the invasion. The officers are not allowed to use force in stopping anyone who is entering. The national media do not report on these stories because it conflicts with their perception of the illegal immigration issue, which is based on an assumption that all illegal immigrants are law-abiding landscapers, maids and day laborers. While this is true in many cases, it is also true that our federal and state prisons and county jails are full of a disproportionate number of illegal immigrants who are committing a disproportionate number of crimes. The federal government has failed to do anything substantive to help border states like Arizona. We have been overrun by immigrants and, once they are here, the state has the burden of funding services that they use. With a $3.5 billion state budget deficit, we have many difficult decisions to make, and one of those decisions is that we don't have the money to care for people who are not here legally. This has to stop. The border can be secured. We have the technology, we have the ability to stop this invasion. We must know who is coming into the country, and they must come in an organized manner - legally, so that we can assimilate them into our population and protect the sovereignty of our country. The national media has distorted, disfigured, and dismembered Senate Bill 1070 to the point that its reputation no longer bears any resemblance to what the bill actually does. Those who claim it is racist, or will foster a Nazi-state are themselves fostering unwarranted and irrational hysteria. The fact is that Senate Bill 1070 merely makes it a state crime to be in the United States illegally. It also explicitly prohibits law enforcement officials from solely considering race, color, or national origin in determining immigration status. Many lawmakers who supported SB1070, including me, also support amnesty, but not until we secure the border. Failing to secure the border only moves us closer to some form of a North American Union with no borders and no national sovereignty. Many of those protesting SB1070 have called for just that. Maybe it is too late to save America. Maybe we are not worthy of freedom anymore. But as an elected official, I must try to do what I can to protect our Constitutional Republic. Living in America is not a right simply because you walk across the border. Being an American is a responsibility. Freedom is not free. Sylvia Allen, a Republican from Snowflake, serves in the Arizona Senate." I say to all those calling for a boycott of Arizona, such as the City of San Francisco, is to boycott these entities. We were considering a trip down the coast this summer and San Francisco will NOT be a part of this. Sadly I know of others who plan to boycott San Francisco or the any basketball games that the Phoenix Suns basketball team participates in, but you will never here this in the media either, only of those boycotting Arizona and the Hotels reporting convention withdrawals. "In the first place we should insist that if the immigrant who comes here in good faith becomes an American and assimilates himself to us, he shall be treated on an exact equality with everyone else, for it is an outrage to discriminate against any such man because of creed, or birthplace, or origin. But this is predicated upon the man's becoming in very fact an American, and nothing but an American...There can be no divided allegiance here. Any man who says he is an American, but something else also, isn't an American at all.